Conor Gough beat Jose Luis Ballester in the final to win the 92nd Boys' Amateur Championship at Royal Portrush today. Gough, a member of Stoke Poges Golf Club, near Slough, becomes the first Englishman to lift the trophy since Matthew Fitzpatrick’s victory at Notts (Hollinwell) in 2012. 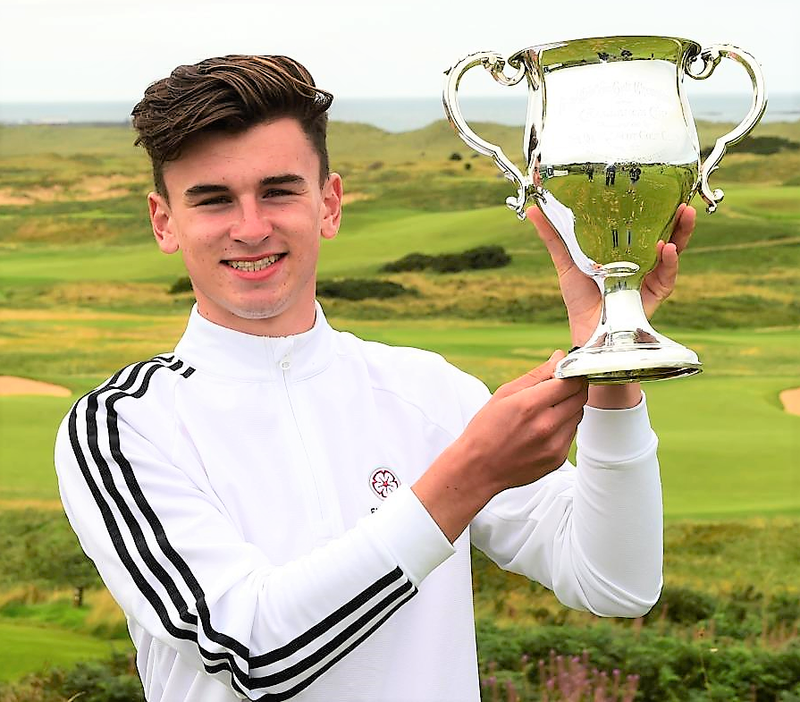 He will now play in The 124th Amateur Championship at Portmarnock and The Island, and gains an exemption into Final Qualifying for The 148th Open, also at Royal Portrush, as a result of his victory. The 15-year-old teed off for the second round of the final leading by two holes over Ballester after a closely contested opening 18 holes of high quality golf. Neither player managed to advance further than a one-hole lead until the par three 16th where Ballester, at one-down, faltered with a bogey. Gough went further ahead, thanks to a birdie at the 17th but the Spaniard hit back on the next to reduce his opponent’s lead to two holes heading into the break. Gough, who already has two big wins under his belt this season, having claimed the McGregor Trophy in July and the boys’ title at the Fairhaven Trophy earlier in the year, never looked back from that point and grew in confidence as the match neared its conclusion. He carded another birdie at the par four 32nd to double his lead and required just a half for victory at the 35th. When Ballester’s tee shot landed in a gorse bush to the left of the fairway he deemed the ball unplayable and took a drop under penalty of one stroke. Sadly, the young Spaniard’s approach fell just short and found a greenside bunker at which point he conceded the hole and the match to the Englishman who completed a memorable 3 and 1 victory. “I feel incredible. It’s a dream come true. I never thought it would have happened this year. I knew I was playing well but I didn’t quite think I’d go this far. Now I’m here the winner so I’m really happy with myself. “The turning moment was 11. I made a 15ft putt birdie to stay all-square and then 12 was big for eagle. I parred 13 and then made another really important birdie on 14. “Jose was really good. He gave me a very good game and he impressed me quite a lot with his irons – he was hitting it close. “I thought I may be picked for the Jacques Léglise Trophy before but I’m hoping now this has really secured it. “I have had an incredible season. I don’t think I have finished outside the top 12 in any competition this year so I am just playing really well and I’ve managed to keep the form going. “Matt Fitzpatrick (the 2012 Boys Amateur Champion and last English winner) is a very good person to follow. If I can keep on following in his footsteps I won’t be doing too bad. “The family are really enjoying this. They couldn’t have picked a better place for me to win so they will be buzzing for me. “I am very happy to be in the Final but I am a little bit sad because I lost but I played very well so I’ve got to be happy with my golf. I have to say congratulations to Conor. The 93rd Boys Amateur Championship will be played at Saunton, East and West courses, from August 13 to 18, 2019. Video footage from the Final is available to download at https://we.tl/t-3r2EF9IDWh.